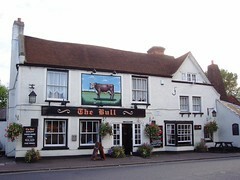 Pub in Theydon Bois, very close to Theydon Bois Station. It's larger inside than you might expect, and is divided into a restaurant area and a bar area, though according to their website the food menu is the same in both areas. There's a flatscreen (as well as a fruit machine and a quiz machine) to the left of the bar, but it's not visible from most areas of the pub. There's a beer garden outside overlooking the village green. Kake, bob, and three friends visited on a Tuesday evening in September 2008. Beers available were Bombardier (£2.75/pint), Greene King IPA, and Spitfire. The Bombardier was fine. Service was friendly enough, and although there was piped music playing, it wasn't obtrusive. The flatscreen was on, but with the sound off. Food is served noon-3pm and 5:30pm-9pm Monday to Saturday, and noon-4pm Sundays. From a quick glance at the menu, it looked quite interesting. Accessibility: One step down to get in. Last visited by Kake, Ewan, Jo and Tube Walkers, 18 July 2009. Opening hours and food times taken from the Bull website, October 2008. Last edited 2013-05-10 06:51:26 (version 3; diff). List all versions. Page last edited 2013-05-10 06:51:26 (version 3).